Work is tough ya’ll, let’s just get it out there. I thought nothing would come as close to the toughness of uni (where the exams stressed me out), but it’s a different level of tough for totally different reasons. It cranks up the stress factor and exemplifies the amount of discipline, efficiency and organisation you need to now have. It takes a while to get used to and I tell people that ask me that it’ll probably take a good 6 months to truly settle into your first proper job – it was around the 6 month mark that I started to feel that I knew what I was doing, was able to use more initiative, take more ownership, and could turn down a notch on my stress level just a tad. Overall, I always recommend investment banking/the finance industry in general as a good place to start your career for anyone who doesn’t 100% know what they want to do – because it equips you with so many good life skills – be it working hard, pushing yourself, client facing skills, and a host of other skills that you can take on with you whatever you next choose to do. The main thing that got to me when it came to work was the cycle of it all – Monday to Friday, weekends zooms past, living for pay day, living for the few days of holiday you have, it’s enough to drive you crazy especially when you’ve been used to so much constant change and absolute freedom prior; however I’ve found that when I set goals and work towards this (be it something in my job or an outside project), it stops me from feeling as though life is truly mundane. Since I was 18 one of my New Year’s resolutions has been to get “fit and healthy”, but actually it was more of a “lose weight before you have to get into a bikini, ok?” resolution. One thing I can say is that although I set myself this resolution last year, for the majority of the year I actually didn’t care about it. It was a pretty good feeling, I didn’t give a sh*t about losing weight or working out or eating healthily for the better half of the year, “summer body” left my vocabulary entirely – most weekends I’d end up eating chicken katsu curry for breakfast over Saturday and Sunday and consume 3/4s of a chocolate cake over the course of the week. But it wasn’t sustainable. I was sluggish, I lacked energy and I struggled to even breath at work with my clothes becoming so tight fitting. In July, when I couldn’t wear my graduation dress to a work gala (because it no longer fit), I thought it was about time to make a change. I was instantly drawn to doing things the unhealthy way at first – the way I’ve done things in the past – and that was just to really, truly, restrict my diet (I would never recommend!!). But this year I couldn’t do that – I work 12 hours a day, I need fuel. Finally, I decided to embark on a health and fitness journey – it wasn’t about the “summer body”, it was about the lifestyle. 6 months later, and I’ve actually kept it up! It’s not even a chore for me to work out anymore, it’s just what I do, and it makes me feel really good. Cleaning up my diet has done wonders for that feeling of sluggishness I used to always have – a chicken katsu curry for breakfast and weekly chocolate cakes suddenly don’t seem as appealing as they once did. To finally master this the right way after 4 failed years is why I mark this as my biggest achievement of 2017. I do want to do a longer post on this including a few things I’ve learned this time round (e.g. carbs are not the devil and weightlifting is lit), but I’m waiting to get a little further in my journey first. Over the past year or so, particularly since I’ve started working in time, it’s occurred to me that a few people seem to have this impression that I actually know what I’m doing. I’ve been invited to a number of coffees and had a number of calls now with people that just want advice – usually on i) getting a job and ii) balance that with other interests (such as this blog). I’ve had the pleasure of appearing on a number of panels, both at work and outside of work, I’ve also even been giving the opportunity to do full on speeches all about myself and what I’m up to. Heck, I was even named as a special guest for a dinner that I signed up to, to meet the special guests. It’s funny because in my head, I still have no clue what I’m doing. I’m just sort of blabbling my way through life at the moment and thus far things have worked out, but there is so much more left on the list of things I want to achieve. However, as you know part of my motivation behind this blog is really to empower and motivate my readers based on what I’ve learned and experienced over time, so it’s also great to be able to do this in a different form now. Things had been pretty simple up to the point of full-time work, we all kind of just rode the education system and anyone also doing things outside of university/school were seen as really impressive for being different and developing themselves in other ways. But now that that system has ended – it’s really time for things to get real. I’ve barely been working a year and people are always asking me “what’s the next step? !”, “when are you going to buy your own place? !”, “are you going to take blogging full time? !” Let me tell you – it’s stressful af. Even thinking about it now makes my heart beat. We all sort of grow up saying “I’m going to be really successful!”, “I’m going to make it!” And now is the time to start laying the foundations to grow that as it’s entirely in our own hands, and the one thing I don’t want to do is fall short of my goals. However, one of my resolutions is to stop worrying so much and if you know me, it’s clear to see how this made it onto the list. Anything is possible with a bit of hard work and patience and this is definitely something I need to start better believing in. Joining Debenhams at the Jingle Bell Ball in a VIP box with unlimited food & drink! I learned that there’s more to life than getting good grades and going to a top university. Sure, these things are great and something to strive to (definitely something I strove to during my time), but it also breeds people into being elitist (once upon a time, me) and the truth is there’s so much more to life outside of this little bubble. I learned to stop trying to paint certain picture of myself and the image of a glamorous life – I can’t live my life for others, I need to live my life for me. I learned that I need to stop trying to convince others that I am X when they think I’m Y. I don’t need to prove myself. I learned to stop doubting myself – I can achieve what I want to achieve. I learned that sometimes life isn’t totally “fair”, but you just need to keep getting up if it knocks you down. After 6 days straight of blogging – I am rewarding myself with a week off! Click on the links below to catch up on my 2017 re-wind, otherwise, I’ll be back on Jan 6th. Happy New Year all! 6 Responses to "2017 in Review & 2018 Resolutions"
I love this post! Whilst the year may have felt “meh” you’ve definitely achieved a lot and I would be proud! 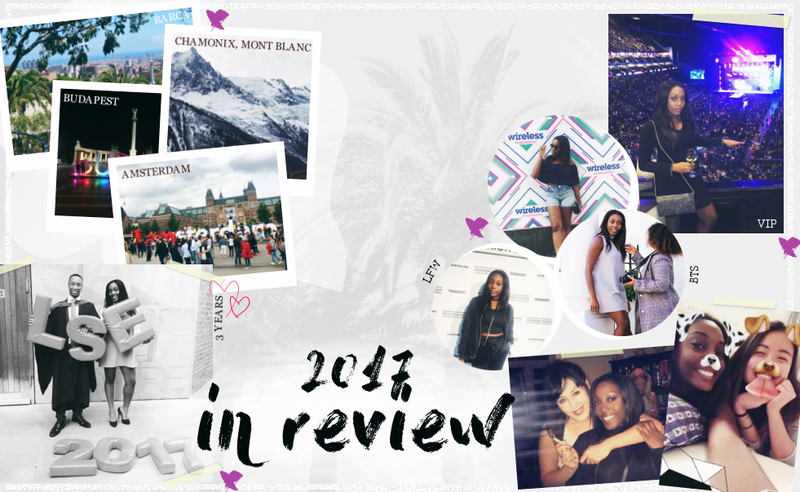 In terms of blogging I’d feel lucky to achieve half of what you’ve managed to do in a year! Health and fitness really was a big part of my year as well and I’ve fallen off a bit towards the end of the year but I can’t wait to see what 2018 brings. My blog is something I know I want to take more seriously in the coming year as well as I’m really proud of it despite it only being a tiny thing in the blogosphere. great lessons are learnt. good luck on achieving your 2018 goals!